Metro Nashville Police officers responded to a fatal shooting near a popular restaurants in East Nashville. 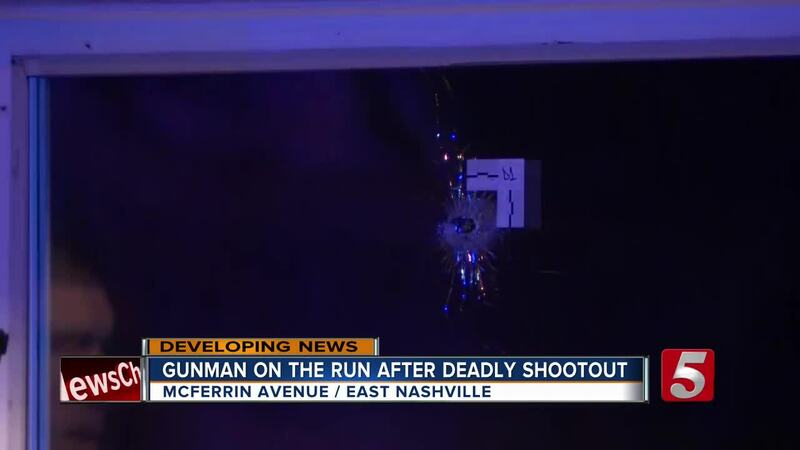 Police have identified a 25-year-old man who was killed in a shooting near a popular restaurant in East Nashville. The incident happened around 6:30 p.m. Tuesday in front of The Pharmacy Burger Parlor & Beer Garden and near Mas Tacos. According to Metro Nashville Police officials, Deangelo Knox was killed during an exchange of gunfire after two vehicles -- a Ford Mustang and Chevrolet Impala -- opened fire on each other at West Eastland and McFerrin Avenue. Police said a security guard from The Pharmacy also fired at Knox after he crashed and headed toward him with gun in hand. Knox was allegedly armed with the gun pictured above. Police searched for several people who fled from the vehicles during the incident. A bullet actually went through one of the front windows of the restaurant, but no one in the restaurant was injured.